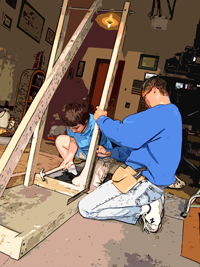 I never got to build siege engines when I was a kid. There were no medieval castles to conquer or Volkswagens to throw. Actually, I do not think anybody thought to throw cars back then. Or at least there were no TV programs showing people doing it. But not getting to build ancient weapons of destruction to throw pumpkins must have been an oversight in my classical education, because now I have helped two of my kids make those projects for school. As a high school engineering teacher, I have assigned a design, build, and test project every year. My students enjoy building stuff that flings, lifts, or moves objects. It is part of the human psyche to want to create and my students love to do the projects. Or at the very least, they remember doing the projects. When I have assigned flinging projects, I am always amazed that many of my students have already built catapults and trebuchets. I used to marvel that high school students had built siege engines as youngsters. Often as school projects. But now I that my kids have built them, I realize that it is just part of the curriculum in some elementary school classes. A few years ago, Thing 2 built a catapult for his 5th grade class. It was a small machine that started out to be a trebuchet. Unfortunately, we did not understand all the inner workings of a trebuchet, so we changed our sling to a peanut butter jar lid screwed onto the throwing arm for the small pumpkins we would be launching for his class. It was a great project because Thing 2 got to saw and hammer wood to make his creation. We got to work on it as a father and son project. And even though it did not fling the pumpkins very far, he knew it was his work and not mine. This year, Thing 3 and I made a trebuchet for his 5th grade class. We understand the release mechanisms better now, but it still needs some adjustments before the final launch on Halloween. Again, he cut all the lumber and hammered all the pieces together. It is a much bigger project than Thing 2’s project was primarily because we had more lumber this time. After all, we pieced both projects together with materials we already had on hand. Its size may be a hindrance though because we do not yet have enough weight to fling anything very far. With Thing 2’s project, I was amazed at what the kids brought to school for flinging pumpkins. Our little siege engine that could was tiny in comparison to the others’ launchers and we wondered how many of the parents had made them. 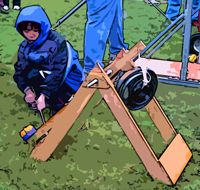 We wondered how many overzealous fathers with heavy duty power tools built catapults and trebuchets while their kids sat and watched. Now, after building one with my youngest, I see that even the larger creations could have been done by the kids. Like Thing 3’s was. I am glad that kids these days get to build cool stuff as projects for class. (Obviously, since I assign build projects.) Personally, I am thankful because I have gotten to fill in some of my own missing education by helping my kids do their projects. Building siege engines is so much fun. And while my kids’ assignments have made me want to build my own trebuchet, I have resisted doing my sons’ projects for them. My kids have been happy building the projects with my help, but I think they wished I had pulled out the power tools to do the cutting and drilling and such. And whether or not they appreciate the fact that they built their projects mostly by themselves, I know that one day they will. I do not really think that my education was subpar because I did not get to build a trebuchet when I was a kid. After all, there were no TV shows or the internet to let people know what they were missing. But after building a couple siege engines with my kids, I do wonder what it would be like if there were castles to conquer. At the very least I wonder how far I could throw a pumpkin. Or a Volkswagen.